This is a continuation of tools I recommend Bishop’s use. You will be helping people financially and spiritually. There’s no way you can remember all the details without taking notes. Take them, lock them in your filing cabinet, then move on. You won’t have to remember the details because you’ve taken good notes. Four days after I was sustained as Bishop I was conducting a funeral for my hairdresser. He was in his late twenties, a young hipster. Because of his connection in the community, and his youth, the chapel and cultural hall were packed, standing room only. In the last four years I have presided over 9 funerals (April, 2014 – make that 10), and probably attended closer to 12-13. I’ve learned that funerals are an experience in people’s life that leave an indelible impression. You can literally make or break people’s opinions about God, the meaning of life, the church, etc. all with this experience. It’s best to be prepared. When someone calls and says they’ve had a death in the family – get over there now. Drop whatever you are doing and get there. Even if everyone knew this was coming, get over there. Once a person dies the timer is ticking and so many things have to be figured out and it all hinges on when the funeral will happen and when the burial or interment will take place. The interment can’t take place unless the cemetery is open and available, the funeral can’t take place until you know when the interment will happen, the obituary can’t go in the paper until you know when the funeral is, the program for the funeral can’t be printed until you know the date, the speakers for the funeral need to know when they’ll be speaking, and the family can’t set up travel arrangements until you know when the funeral and interment is happening. If you can help a family prepare for an upcoming death, do so. Yes, it will be hard. Yes, no one likes to talk about death. Help them work through it; buy a funeral plot, casket, etc. Walk through the finances of the remaining spouse. Have the hard conversations. You’ll be sorry if you wait to do it later. Funerals are typically on a Saturday, make sure no one will be showing up just before to clean the building. Make sure the landscaper will not show up right before or during the ceremony. Call them and have them do their work the day before. Make sure you arrive early enough to check the temperature in the building – get the heat/AC going. As it’s not a typically scheduled meeting the heating/AC timers won’t automatically come on. You potentially will have a lot of non-members in the building so this is a great opportunity to make a good impression. Make sure you have Priesthood backup. Make sure someone is there to be your runner. There will ALWAYS be something that is amiss, or that needs fixing i.e. all the paper is out in a bathroom. You will need someone you can ask to go and fix things, while YOUR duty is to be there to support the family in this difficult time. That means you’ll be standing around, but that’s OK. You need to be there and be present. Send your runner to do the last minute jobs. Lastly you’ll want someone to stand by you as the family is gathering. In this difficult time when you will be surrounded by people you don’t know, it’s helpful to have a familiar face to support you. I’ve compiled my findings and helps HERE. 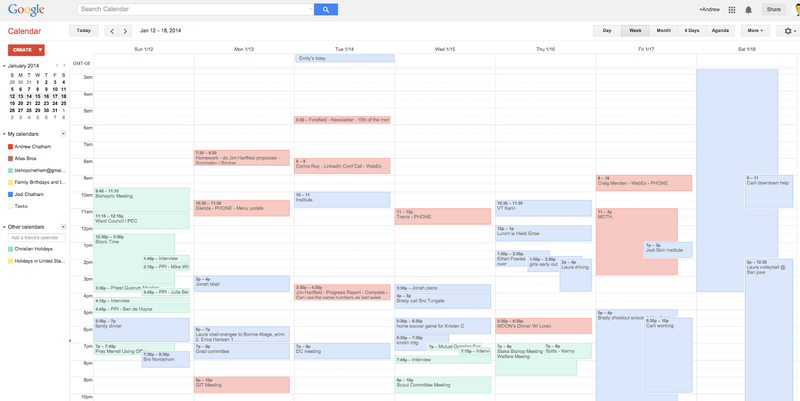 Google calendar is amazing! Blue is family, Red is work and Green is church. Basically a hard drive shared in the cloud – for free. We share all our ward tools through Google Docs. You’ll find the templates all throughout this page. Click on the links to dig in. I performed a wedding for my brother just over a year ago. In speaking with many other Bishop’s in our stake, I’ve compiled a number of tools to help Mormon Bishop’s with wedding ceremonies. Happy to share these documents/outlines. You can view them HERE. Oath and Covenant of the Priesthood. The members of our Stake Presidency have done a great job putting together a few documents that help us prepare our young men to receive the Melchizedek Priesthood. You can view those documents HERE. Click Here to view the Google document. As Bishop I continually work with individuals that are struggling through mistakes they have made. Feelings of guilt, and low self esteem are common. I’m continually working to find resources that I can share with those who are working through the repentance process to help them understand the atonement and what it truly means for them. – Please let me know if you have found any specific books that are helpful. A great way to help those struggling with mistakes they’ve made to understand there IS hope. MLS will print your entire organization in 14 pages. Not very helpful. I need to see things on one page. My Exec. Sec. or Ward Clerk update these for me. Very helpful when thinking / talking / praying about callings. What’s your agenda? My Exec. Sec. keeps this updated every week. Who does what? In our first meeting with my Bishopric we decided who would do what. That doesn’t mean it was set in stone. But it’s so important to know who’s responsible for what. When an issue comes in, you push it to the person who’s responsible for it. Having a script to go by when you’re standing in front of 50, 100, 15, 200+ people is critical. Especially in the beginning. Especially when things go wrong. It’s like having a handrail to hold onto. Believe me, you’ll need it. To see the COMPLETE updated list of all my helps, see this post. Hi Bishop Chatham, I was called last night to be a Bishop in North Dakota. I really appreciate the helpful information you provided and would like to see the google drive documents you mentioned. The wedding and funeral items would also be very beneficial. My email is bishopdanielward@gmail.com. I look forward to future updates. Thank you again! I hope you got everything I emailed you. I hope it was helpful. Good luck! Previous Once again, the Relief Society saves the day.